In the year I was born, Sean was the 39th most popular boy's name. If I was born today, my name would be Hunter. My 4 year old wants me to read the same books to him night after night. He becomes obsessed with these books for weeks until he rediscovers other books. Lately, he has been all about Curious George. I'm not sure why the tense changes from present to past so quickly, but what do I know. Maybe he was a good little monkey but isn't anymore. He was a good little elephant and always very happy. Very clever, right? My son didn't think so and simply replied, "No be funny, daddy." No be funny indeed. He clearly takes his Curious George seriously. I'm not a television news producer nor do I play one on the internet (as you can tell by the poor quality video below). However, while watching Baltimore's WJZ noon news broadcast on Monday, I had to question why these stories appear back-to-back. If you couldn't hear it (or don't feel like watching this), the first story is about ISIS/ISIL in Iraq. This is followed directly by a story about Vic Kleman, the 82 year-old who rode Kennywood's Jack Rabbit 95 times on Sunday to reach 5,000 rides on this roller coaster during his lifetime. I have no idea how Kleman figured this out. My guess is that I've been on the Jack Rabbit about 100 times, and that is a complete guess. You can read more about Kleman and his Jack Rabbit adventures in this Post-Gazette article. You can also help me understand why these two stories aired consecutively since I have no idea. We've been members of Costco for several years now, but with our membership about to expire, I don't think we will renew. Yes. I'm writing a blog post about this. 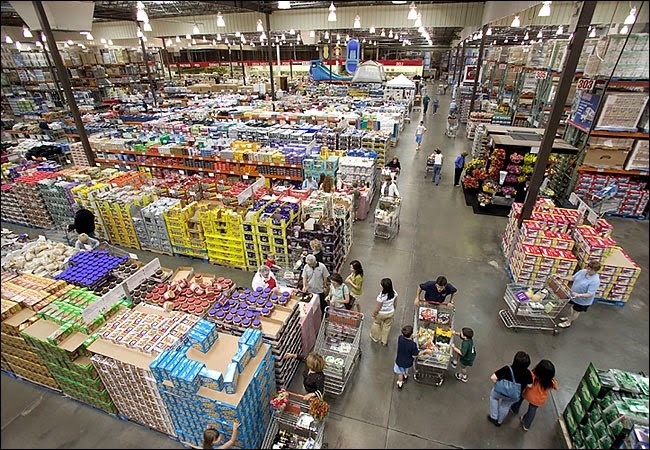 The annual Costco membership fee is now $55, either $10 or &15 more than when we first joined. However, despite having two kids and thinking that we'll need more bulk items than before, I've found that we go to Costco less and less. Let's do some math. The primary pro for renewing the Costco membership is the gasoline prices. Costco's gas is generally about 10 cents a gallon less than any other gas station in the area. If we get gas 40 times a year (I rarely get gas for my car since I rely on public transportation and only drive locally), that's probably a savings of about $40. Yes, a $40 savings is less than the $55 membership fee. Plus, the problem with getting gas at Costco is that you have to arrive either early in the morning or late at night. If you arrive when the store is open, the line is generally at least 4 cars deep despite there being 75 pumps (slight exaggeration). I probably waste as much gas waiting in line than the savings I get. Other than gas, there really isn't much major savings. The bulk items we buy at Costco (ex. paper towels, toilet paper) are approximately the same cost as the bulk items at Wegmans. 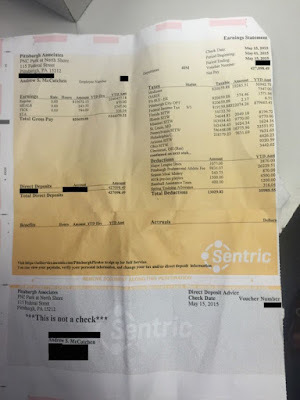 While formula was slightly cheaper at Costco, we usually used a rebate check/coupon that Costco would not accept. That coupon made it cheaper ton buy formula elsewhere. Man, I hate that Costco doesn't take coupons. Now, we don't need to buy formula anymore. WOOO! The Target diapers work just fine too. The one plus on Costco's side is that we prefer the Kirkland wipes to others. And yes I just bought 4 boxes of them anticipating that we wouldn't renew. So I'm sure you're asking, but Sean, what about the free samples and the $1.50 hot dog and Coke? Well, if I feel the need for this, I still have my Costco card. I can still flash it at the front door and get a free sample of some frozen appetizer. I just wouldn't be able to check out with a 24-pack of GoGo Squeeze applesauce (which is about the same price per sauce as the 16-pack at Wegmans). And if I truly need a 20-pack of soap, I can probably find a friend with a Costco membership and borrow their card. 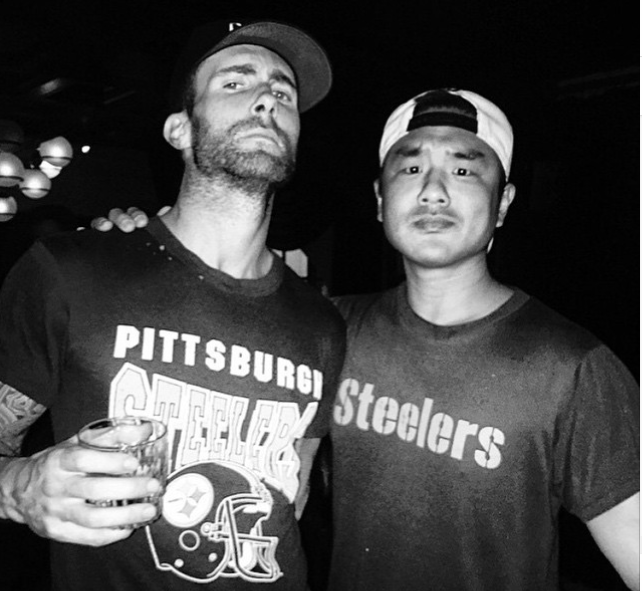 The story here is Adam Levine wearing a Steelers shirt. Woo! Now let's see if Levine will watch a Steelers game with Pittsburgh native and People Magazine's 2014 Hottest Bachelor, Joe Manganiello. When I turned 16, I got my driver's permit and later my license. What a sense of freedom to be able to go to the store to buy milk or to pick up your brother from soccer practice. When I turned 18, I could legally buy lottery tickets (check) and cigarettes (pass). At 21, I could (and did) legally drink. I also learned that drinking a Long Island Iced Tea and other alcohol and finishing the night with Ben & Jerry's ice cream is a terrible idea. At 35, I was eligible to serve as President. To celebrate, I wrote a blog post about it. I presented my platform a few years later. Through all of this, it took until now, today, at the age of 40 to be a man. While riding the Metro this morning (hooray for no major delays! ), I'm sure that I received some curious glances since, like the woman on the left, I couldn't stop smiling from looking at this picture from Express. Seriously, what is going on here? Are these some new Lamaze techniques? 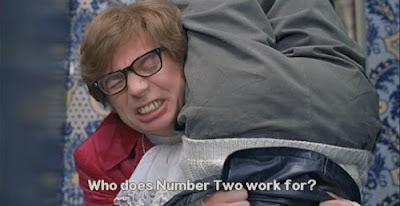 Practice for, um, going #2? 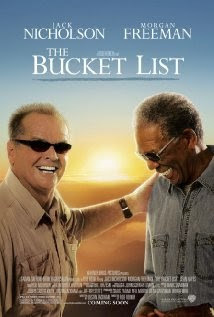 There was a movie a few years ago starring Jack Nicholson and Morgan Freeman called The Bucket List. In a bit of false advertising, this movie was not about the various types of buckets or even about Buckethead from the later edition of Guns 'N Roses. Instead, this was a comedy (I think; I didn't actually see the entire film) following the two Oscar-winning actors completing a wish list of to-dos before they die. Seeing that a major milestone for me is quickly approaching (more about this in a few days), I thought I would share my bucket list. - Travel, travel and more travel. I want to visit all 50 states (I'm only 9 short) and 6 continents. (I have no interest in visiting Antarctica.) My international travel has been limited to Canada, a few trips to Israel and a summer in Lancaster, England (with stops in London, Edinburgh, Paris and Dublin). I want to visit Italy, Australia, Japan and so many other places including Guam so that I can hang out with Ric Blas. - See the Pittsburgh Pirates win a World Series. The Pirates last won the World Series in 1979. I was 4 and don't remember anything about it. I've been fortunate to witness the Penguins win Stanley Cups and the Steelers win Super Bowls, but the Pirates may be the team I care about the most. - Attend National Hockey League games in every NHL arena. At our current pace of visiting a city or two every year, I think we're going to accomplish this goal in 2021. At some point I need to actually write about the last trip to Florida (besides the actual flight to Florida and the obnoxious person on the plane). - Get 100 likes on the Sean's Ramblings Facebook page. Seriously, I've been stuck at 25 for months. - Get invited to the White House. I'm not talking about getting to attend the Christmas Tree lighting or Easter Egg Roll but an actual White House invitation. Maybe I'll get to attend when the Pirates visit the White House after winning the World Series! - I'd like to attend the Bar/Bat Mitzvahs of multiple grandchildren. My oldest child is 4. Let's say that he has his first kid at 32. That's 28 years from now. Then, add another 13 years until the Bar or Bat Mitzvah. At that point, I'd be over 80. Okay, this one is a little deep. Let's lighten things up a bit. - What I'd really like to accomplish is to watch everything on my DVR before I die. This is probably the most unrealistic item on my bucket list. - Throw out the first pitch before a baseball game. While ideally this would be at a MLB game, I'm fine if this occurs at a minor league game...or Little League game. - Win my fantasy baseball league. Achievement unlocked! I'm sure that I'm missing some things, but I think this is a good start. Yes, it's the extremely rare Sunday blog post. I just wanted to wish a Happy Mother's Day to all those are celebrating. To the moms out there, keep on rolling! This video, a combined performance by REO Speedwagon and Imagine Dragons, has absolutely nothing to do with Mother's Day. I just think it's cool and wanted to share this. By the way, I'm glad they performed a REO Speedwagon song. That turned out much better than if they performed Radioactive. Once again, I thought I discovered an artist/song well before most other people. Then, I learned that the video has over 6.5 million views on YouTube. Oh well. Today's video is Beggin for Thread by Banks. Not Elizabeth Banks, Carl Banks, Tyra Banks or Lloyd Banks, just Banks. Apparently, she doesn't want you to see her right eye. Maybe she had pink eye in the right eye during the shooting of the video. If that's the case, she's putting all of those dancers and possibly even the horse at risk of contracting pick eye too. Of course, maybe she just had problems with her right contact during the video shoot. I received a message in my Spam folder recently from someone named BadGirl28. Yes, it really was a Spam folder. Anyway, I was curious about why BadGirl28 went by BadGirl28. My theory was that maybe she was a big fan of Marshall Faulk. If she's from Pittsburgh, maybe she loves Brandon Cumpton, Ian Cole and/or Cortez Allen. If she's in the DC area, perhaps she is a big fan of Jayson Werth (and she probably supports his abuse of mascots). I'm really curious about the eye color thing. Is one eye light blue and the other brown? 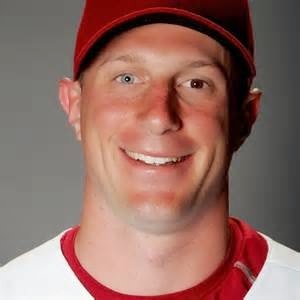 Is she like Washington Nationals pitcher Max Scherzer? I also got messages from BadGirl22 and BadGirl25 with the exact same message, so I'm thinking that maybe there is no significance to BadGirl's numbers. Wait, stop the presses! Is this the same Adriana from a few years ago? If so, I'm happy that she's just giving basic information rather writing a long message. Based just on her last sentence, her grammar is still poor.